Superman a Methodist? Nah, He's a Lutheran! Church elder and deacon, chemist, businessperson, blogger, and comic book aficionado John Schroeder points to a study that tries to pinpoint the religious affiliations of various comic book heroes. 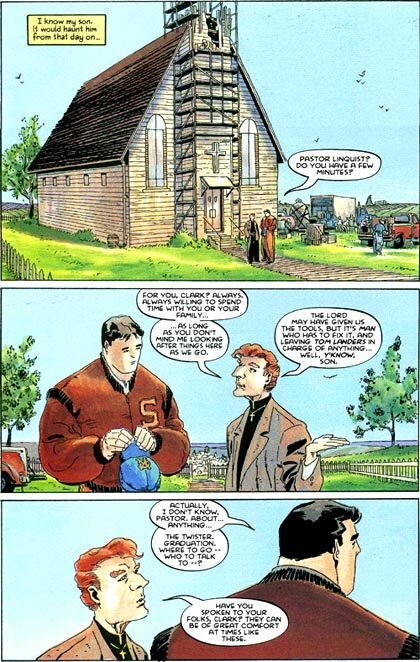 Three panels on the left of John's post (seen here on the right) shows a young Clark Kent speaking with his pastor. The pastor's name is Linquist, which made me wonder how the author of the study John cites could say that Superman was a Methodist. Superman a Methodist? And his pastor is named Linquist[?] Chances are with a pastor bearing a Norwegian moniker like that, the Kents are Midwestern Lutherans. Besides, everybody knows that after serving [in] Smallville, Pastor Linquist went on to [become] pastor of the Lutheran congregation in Lake Wobegon, Minnesota. At Mid-Year, Who Are the Top Candidates for TIME's Person of 2006? If TIME magazine had to name the Person of the Year for 2006 today, who would it be? TIME's criteria for making this selection appears to be pretty simple. Who, they ask, is the person who most personifies the year and has had the largest impact on people's lives, for good or ill? In a way, the very notion of a Person of the Year (called Man of the Year until a short time ago, reflecting, no doubt, our thankfully and belatedly progressing attitudes about the equality of the genders) is an anomaly, a vestige from the past. Much of the history of History as a discipline has been marked by the belief that great people make history and that the rest of the residents of the planet at any given time are also-rans. Warren Buffet: A $37-billion check to the Bill and Melinda Gates Foundation is what you might call a major gift. Does he represent a renewed commitment to ongoing, and not sporadic, generosity? Patrick J. Fitzgerald: The special prosecutor is uniformly regarded as a straight and fair shooter. His investigation of Washington corruption has yielded indictments bound to please and infuriate partisans on both sides of the political divide twixt Democrats and Republicans. Al Gore: He appears to be riding a wave of increased public acceptance of the notion of global warming. Who knew that a Keynote presentation could become a widely-viewed movie? Rick Warren: He continues to influence millions through The Purpose Driven Life and its collateral programs. He also joined other evangelicals in speaking out against global warming and leaders from other religious communities in condemning torture as a policy of the US government. Like him or not--and I really like him--he's a major influencer of people. Agree with him or not, he makes you think. George W. Bush: While his approval ratings have sunk, he appears to be on something of a rebound rooted in his stay-the-course approach to Iraq. When it comes to the war, Americans appear to be saying, "We don't like his policies. But we can't come up with anything else." Neither can the Democrats, it seems. Katie Couric: She's taking a chance worthy of a high-wire artist, moving from the Today Show, where she's enjoyed early-morning TV dominance for an unprecedented stretch, to go to the uncertainties of the CBS Evening News. Her mission is simple and daunting: To make one of the former flagships of network television relevant again and this at a network long mired in third place. Couric represents that second-wave of women professionals in the US, confident of their places in arenas once reserved for men, yet comfortable with and unapologetic for their feminity. Gnarls Barkley: The Brit duo became the first to go to the top of the charts in their country even before their single hit the stores. They did it with downloads, surely a harbinger of the future. Pope Benedict XVI: He confounded his critics by turning out to be, in his first year as pontiff, far more conciliatory and thoughtful than his previous stint as doctrine director for the Roman Church led them to believe he would be. However you evaluate what he said in Poland, the very fact that a former member of the Hitler Youth reached out to Jews there and condemned antisemitism in a country which is increasingly legitimizing the prejudice is big. Who else would you consider? Two tyrannical tots: Mahmoud Ahmadinejad, president of Iran, and Kim Jong Il, president of North Korea: In the years immediately before World War II, despotic strong men who hated democracy came to power in the Soviet Union, Germany, and Italy. In spite of the philosophical differences between Stalin, Hitler, and Mussolini, each drew inspiration from the other, the brazenness of one dictator encouraging the next to new acts of butchery and aggression. Something of a similar nature is happening with these two tots. The narcissistic Kim Jong Il had apparently accepted that he needed to deal with the international community and to keep his country's 1998 promise not to go near nuclear weaponry. But then, Ahmadinejad, the one-time kidnapper of American embassy hostages, was elected president in Iran. Although many in his country view him as something of a sideshow freak, not unlike bygone Germans and Italians viewed Hitler and Mussolini, respectively, many Iranians, with their large educated middle class agree with their president that Iran should be able to develop peaceful nuclear energy. That, in spite of what the international community sees evidenced, is what his country wants to do, says Ahmadinejad. And so, he tweaks the nose of the world, especially the US, temporizes, accuses, and raises a ruckus, the whole world paying attention to him and calling for talks from which he can hope for concessions. The Iranian imbroglio has, in turn, roused Kim Jong Il's jealousy. It has also enlivened him to the possibility that he might be able to get more aid for his pervasively impoverished country, freeing him to spend more money on his military. The two tyrannical tots have loomed over much of what has happened in 2006. Two Rising Economic Giants: India and China: Of the two, the one most likely to become the next economic superpower is India. India is democratic, has a larger middle class, and, as anyone who has ever called for assistance with their computer or ISP knows, linked to the new technologies that will continue to be a vital force in the years ahead. China, with its vast population is an economic force to be reckoned with, of course. But the despotism of the government and its contempt for human rights will likely hamper its development. Political freedom is always the precursor of lasting economic freedom. Nonetheless, the two countries are making their presence felt globally. India is gaining strength in many ways. The US is paying increasing attention to the country, seeing India as a buffer against Chinese hegemonic designs. China menaces the world, building an ever-burgeoning military with designs on dominating Asia and the Pacific basin. Western acquiescence, especially US acquiescence to China, on economics and human rights issues only emboldens the Chinese leadership, just as a complicit world once emboldened Adolf Hitler. And it isn't simply governments that idly fail to deal toughly with the Chinese government which are at fault. American businesses, like Google and Yahoo, give aid and comfort to the oppression of the Chinese simply because they want access to the Chinese market. The Chinese system of despotism is destined for the ash heap of history, to be sure. But the West must decide whether it wants to encourage imminent Chinese military aggression and continued totalitarianism by acting as the current regime's economic enabler or if it wants to contain the Chinese communists, denying them the things they need to cause the world heartache, pain, and death. God has revealed Himself first of all, as our Father. Of course, in saying this, neither the Bible or Christians means that God the Father is of the male gender. Jesus says that God is spirit, for one thing. For another, when God created the first human beings, we're told that they were made in the image of God and that God created them male and female. Both the man and the woman reflected God's image in some way; God is really beyond gender. The Father is the first Person of the Trinity I described in my last post. It was really Jesus Who used this term of the Creator with any frequency. References to God as Father were rare in Old Testament times. God is mindful of us because He loves us a bit like a human father loves his children. The Father wants to be with us in every part of our lives. Jesus conveys how close the Father wants to be to us by the particular Aramaic word He uses for Father. He calls the Father, Abba, a term that can be translated as Daddy. If you've come from a family where the adult male in your household wasn't much of a father, this image of the first Person of the Trinity may be difficult to latch onto. It may even turn you off. Hang in there with me, please. In the next installment of this series we'll look at what this Father is like. Research summarized in this article from In Character seems to say so. They're also more empathetic. But in recent years, the disparity between male and female attitudes about the importance of keeping or giving money has narrowed. Yet, there are consistent differences in male and female attitudes about altruism. [Women] are more likely than men to list altruism as one of their life goals. For forty years, the Higher Education Research Institute at the University of California (Los Angeles) has conducted an annual survey of the attitudes and preferences of college freshman. Since the mid-1960s when the survey began, the sexes have become more alike in their answers. For example, in 1966, only 30 percent of freshman females said that “being very well off financially” was essential or very important to them. For men, the 1966 figure was 53 percent – a 23-point difference. By 2004, the gap had narrowed to 3 points (72 percent of females counted financial success as essential compared to 75 percent of men). However, despite this convergence, there is one major, persistent disparity between male and female respondents that has not been affected by the dramatic social changes of the past four decades. Approximately two-thirds of women say “helping others who are in difficulty” is an essential or very important life objective, compared to only half of the men. In 2004, for example, 70 percent of female freshman identified helping others as essential; for men it was 53 percent (a 17-point gap). In 1966, the gap was nearly the same – 19 points. Superman Returns features some good performances from Brandon Routh as the Man of Steel, Kate Bosworth as Lois Lane, and James Marsden as Perry White's nephew, Richard, along with solid supporting turns from Eva Marie Saint as Martha Kent and Frank Langella as Perry White. There are also fun cameo appearances by Noel Neill, who played Lois Lane in the 1950s-era TV series, and Jack Larsen, that series' Jimmy Olsen, as Bo the Bartender. They were fun to see! The film also pays tribute to the 1978 to 1983-Superman movies starring Christopher Reeve. (In fact, the film is dedicated to Reeve and his wife, Dana, both of whom met early, tragic deaths.) At some moments, in fact, Routh bares a striking resemblance to Reeve. There are a few spots of good humor in this film, such as when Langella's White, recites just once and in a wonderfully understated way, the line which generations of Superman fans have come to associate with the editor of The Daily Planet: "Great Caesar's ghost." The special effects are stunning, something which those earlier incarnations of Superman could have used. And, as always, it was great to hear some of the original scoring composed by John Williams for the three films that starred Reeve. But Hollywood hopes that this film might revive moribund domestic movie theater revenues are ill-founded. For all its computer-generated noise, bells, and whistles, Superman Returns never really goes anywhere. The plot is thin and predictable. Kevin Spacey's performance as Lex Luthor is flat and uninteresting. His scene with Bosworth is particularly atrocious: It required comic sensibility layering a barely-concealed madness. He achieves none of that, managing only an amateurish theatricality. This is disappointing because I think that Spacey is a fine actor. The one scene in which Spacey manages to emote somewhat credibly is also the one scene that I wish had been done completely differently. In it, Luthor and his henchmen, employing Kryptonite to rob Superman of his powers, engage in a scene of such violence that I would advise parents whose children are fourteen or younger not to let the kids see the movie. There is no gore in it, simply vicious, disturbing violence. The film ends with a lot of loose ends, displaying the producers' obvious intent to make a sequel. That will no doubt happen. But I give Superman Returns a C+. 1. Both of Paul's letters to the church at Corinth indicate that, reflective of the culture of that Greek city, the Christians there were prone to excess. Someone has aptly described Corinth as "the Las Vegas strip of the ancient world." Corinthian culture was not so much interested in keeping up with the Joneses as grinding those neighbors in the dirt. But, here Paul approaches the next topic of this letter in a manner typical of his approach to those either with no faith or who were weak in faith. In the book of Acts, where Luke, the writer of the Gospel of the same name, tells the story of the Church from Jesus' ascension until about thirty years later, we're told about what happened when Paul went to the city of Athens, also in Greece. Paul was disturbed by all the shrines the Athenians had erected to various "gods." The old Paul, the guy known as Saul who was a Pharisee, would have rhetorically gone after the Athenians with both guns blazing, spouting the injunction of the First Commandment to have no other gods but the one true God revealed to the people of Israel and ultimately, through Jesus Christ. And, at one level, he would have been right to do so. But Jesus Christ has changed Paul. He isn't interested in scoring debating points that prove how righteous he is and how unrighteous others are. He wants instead, to help people know Jesus Christ. It's through Jesus that we sinners can turn from sin (repent) and trusting in Jesus as our God and Savior, be given new and everlasting lives. Jesus is, in fact, Paul's model for this approach. When you read the Gospels, you notice that the only people Jesus ever excoriates or condemns are the religious folk who know God's will and yet deliberately flout it or ignore it. In other words, Jesus only gets in the grills of those who should know better. But consider Jesus' behavior toward the woman caught in adultery, or Zaccheus, the extortionist-tax collector, or the countless numbers of sinners with whom He willingly spends time: He never upbraids them. He teaches them and gently brings them along. There are times when He grows angry or frustrated with His own closest followers. But even with them, when they act or speak out of ignorance of His will or ways, His method is to be gentle, to meet them where they live and to take them to the next level of their faith. Paul meets the Corinthians where they are: "I know how much you want to excel at things," he tells them. "There's a very important way in which I want you to excel, in generosity." 8I do not say this as a command, but I am testing the genuineness of your love against the earnestness of others. Never require by command what can be evinced by persuasion, especially persuasion empowered by the Holy Spirit. 2. Paul wants the Corinthian church to choose, out of the love implanted in them by Jesus Christ, to be generous givers. He's already used Second Corinthians 8:1-6, especially verse 3, to show them what generous givers who choose to give look like. 9For you know the generous act of our Lord Jesus Christ, that though he was rich, yet for your sakes he became poor, so that by his poverty you might become rich. 1. Paul now mentions the example of generosity: Jesus' voluntary giving of His life on a cross to take our punishment for sin. He uses financial imagery to describe this divine transaction. Paul is not, here, arguing that God has done so much for us and we ought therefore to show our gratitude by our financial gifts ('and they ought to be big!!'). He is not waving the big stick of God's right to be worshipped with money. There is nothing about paying back God's generosity nor about secret rewards for divine investments such as our own personal prosperity in this life or the life beyond. Christian giving is all about partaking of the privilege of participating in Jesus' mission of grace and love in the world. (Second Corinthians 6:1) Paraphrasing a point made in the New Interpreter's Bible: If the Corinthians understand that it's God's grace that makes them children of God, then they won't be able--and won't want--to stem the overfloow of that grace through giving. 10And in this matter I am giving my advice: it is appropriate for you who began last year not only to do something but even to desire to do something— 11now finish doing it, so that your eagerness may be matched by completing it according to your means. 12For if the eagerness is there, the gift is acceptable according to what one has—not according to what one does not have. 1. One year earlier, the Corinthians apparently welcomed Paul's call to join in the general offering for the impoverished and persecuted church in Jerusalem. (I discuss that here.) But their initial enthusiasm has not been matched by their ensuing action. The road to hell may be paved with good intentions, as the old saw advises. But what is clearly true is that intending to do the good thing without doing it leaves the good thing undone. 2. Without condemnation, Paul exhorts the Corinthians to act by commending their original enthusiasm. 3. Paul is always "Mr. Practicality," inveterately offering all recipients of his communications, including us, practical ways to enact the Christian truths he commends. Here, says The Interpreter's Bible, he offers two suggestions: (a) recapture your original enthusiasm for giving to Christ's people at Jerusalem; (b) Follow through on your desire by doing the offering. This he states twice. Paul now presents the basic principle behind his argument. It is the principal of fair-dealing. My "plenty" should supply the "needs" of my brothers and sisters in the Lord, in such a way as to allow them to use their "plenty" toward my "needs." "Givers," says Chris Haslam about this passage, "should attain a 'fair balance' (v.13); relieving the poverty of others but not impoverishing themselves." But when they measured it with an omer, those who gathered much had nothing over, and those who gathered little had no shortage; they gathered as much as each of them needed. 3. Paul speaks of how the church at Jerusalem, Jewish Christians, through its faithfulness, had made it possible for the church at Corinth, largely made of Gentile Christians, to know Jesus Christ and His salvation. As the Jerusalem church had given out of its wealth--the Gospel of Jesus, Paul asks the Corinthian church to give of its material wealth. He makes an analogous argument with the Roman Church (Romans 15:27). Reciprocity and care among believers are givens for Paul. It makes sense when one remembers the command that Jesus gave to His Church in John 15, to love one another as He has loved us. "God is thankfully, beautifully, gracefully mindful of us"
The psalmist wonders what human beings are that God would be mindful of us. I don’t know what we are. I don’t know what we bring to the table of creation. It seems that we gum up the works as often as we contribute something meaningful. But God is thankfully, beautifully, gracefully mindful of us. We are in God’s mind. We are born of his creativity and that creativity, lives in all the cells of our bodies. Our lives matter. We make a difference in the world. How we live is important, so in humility, live well. What we choose helps to change the world, so listen prayerfully and choose well. God makes use of our lives and our creative choices. God is mindful of us. Remember this, and it shall be well with your soul. It shall be well within you. Listening to the young man’s story, I’m amazed. Just a few miles from where my family and I have lived for the past sixteen years, Todd has grown up. We seem to be from different planets. The story of the family that my wife and I have raised is a functional, if imperfect, one, filled with things like family vacations, school concerts, braces and dating, high school and college graduations, and so far, one wedding. It’s been a happy life. But in New Richmond, the story of seventeen year old Todd, the Boys and Girls Club of Clermont County’s Youth of the Year, has been very different. His father abandoned the family when Todd was young. His mother got involved in using and selling drugs. Every member of his extended family was on public assistance and none finished high school. In Todd’s early years, he was on the same grim path of dysfunctionality. But today, Todd works for a local bank and will begin his college career at the University of Cincinnati this fall. He graduated from New Richmond High School, one year ahead of schedule. Todd is an extraordinary person. But this is no “pull yourself up by your bootstraps” story. Have you ever tried to pull yourself up by your own bootstraps? It can’t be done. Todd has, of course, worked to get to a place that none of his family members has reached. Only he could study and pass the tests that have led to early graduation. Only he could decide to forego the temptation of following the paths of least resistance: drug use, reliance on public assistance, cruising through school and life, skirmishing with the law. But the truth is, Todd was helped to make the positive decisions he’s made for his life. Much of that help came from the Boys and Girls Club of Clermont County. Every day of the school year and in special summer programs, the Boys and Girls Club of Clermont County, with one club in New Richmond and another in Amelia, plants the seeds of possibilities and hope in the lives of hundreds of Clermont County youths. Members, aged six to eighteen, gather after school until 7:00 PM each school day. There, they get homework help. They participate in structured activities and they get the attention of caring adults of character. Some club members participate in special programs offered by the clubs. For Todd, one called Passport to Manhood, which fosters character development in young men, proved life-changing. The Boys and Girls Club of Clermont County isn’t a government agency. It exists because ordinary people like you see how important it is. Through the club, kids are taken off the streets and out of often-empty homes during those hours of the day when, statistics show, they’re most likely to get into trouble, become pregnant, commit a violent crime, be subjected to sexual predators, or become victimized by violence. During those same hours, between 3 and 7 PM, they’re also given help with their schoolwork and more importantly, hope and the tools of self-discipline. I wish that every adult in Clermont County could see what happens at the clubs. They would see, as the teachers of Boys and Girls Club members and the officials of our Clermont County juvenile court system have seen, that young lives and communities are being changed for the better. If you did see this, the Boys and Girls Club would quickly achieve its dream of being in every community in our county. If you’d like to know more about the Boys and Girls Club of Clermont County, why not contact their office at 553-0188? They’d be happy to provide information or take you on a tour. But if you’re already convinced, as I am, that you want to be part of this organization’s work, consider making a contribution to the Boys and Girls Club of Clermont County every year. Your annual gift of a $1000, $500, $100, or whatever you can afford, will help more Todds (and Teresas) see the possibilities for their lives. It just takes one person like you to make a difference in the lives of young people like Todd. Why not be that one person? 2. Chapters 8 and 9 of this letter deal with a collection that Paul is receiving from all of the churches with whom he has relationships. In different letters, now books in the New Testament, Paul variously describes the recipients as the poor or the saints in Jerusalem. Apparently, a famine had hit Jerusalem and the Judean countryside. The original Christians were hurt by this event and it's part of the ethos of Christian faith that we're to love Christ, love our brothers and sisters in Christ, and love the world. The offering Paul is soliciting is meant to be an active, practical way for the largely-Gentile Christian churches in places like Asia Minor and Greece to express their love for the Jewish Christians in Jerusalem. Historians and Biblical scholars also indicate that well before the date at which Paul sent this letter, the church was being persecuted, some of its members lashed or killed, in Jerusalem. 4. The offering has its roots in the famous conference at Jerusalem discussed in both Acts 15 and Galatians 2:1-10. As one would expect, the two authors of those accounts, Luke and Paul, respectively, have their own spins on the events there. (No two people ever look at things in precisely the same ways.) But from both, we know that the conference, which involved the acknowledged leaders of the Christian movement (still seen as being part of Judaism) and fresh from their evangelizing (literally, good newsing) efforts "in the mission field" outside of Judea, Paul, Barnabas, and Titus. The issue: The insistence of some Jewish Christians that before Gentiles who had come to believe in Jesus Christ as God and Savior of the world could be part of the fellowship, their male members would have to become like them. Specifically, they said these Gentile believers had to be circumcised. Their argument was that in order to become a Christian, one must first become a Jew. Two-thousand years later, it's too easy to dismiss the Jewish Christians who said this as being fat-headed legalistic. But that wouldn't be fair. In the whole experience of the Jewish people, the only ones who could be considered as being part of the Kingdom of God were those who had observed the rites of Judaism. They acknowledged, as Jesus taught and as the Church taught after Jesus had risen from the dead, that people are saved from sin and death and given new, everlasting lives because they repented of their sin and believed in Jesus. But for them, it was a massive paradigm shift to say that God's gracious acceptance of repentant believers didn't have to observe the same religious laws that had always been associated with Israel's God. The purpose of the conference was to decide what obligations the Gentile Christians had. According to Luke, after prayerful consideration of the Scriptures, for the sake of amity and continued fellowship, the leaders of the Jerusalem church asked the Gentiles to observe certain practices out of love for the Jewish Christians among them. Paul says that the council also instructed them to "remember the poor," which Paul says was exactly what he wanted to do in any case. 6. Paul calls for the Corinthians to display generosity not as some sort of payback to God for what He has done for humanity through Jesus Christ and not to get rewards, two reasons for giving often toted out by preachers trying to put the financial squeeze on their congregants. Quite simply, Paul sees giving as a practical way of loving. Giving allows us to be part of the mission of God in the world, helping us to work together with God. (Second Corinthians 6:1). I hope to present a verse-by-verse look at the passage later in the week. We shall see. The war on cancer was launched in 1971 by President Richard Nixon. "The same kind of concentrated effort that split the atom and took man to the moon should be turned toward conquering this dread disease," Nixon proclaimed. Thirty-five years and billions of dollars later, the war remains far from won. There were 556,902 cancer deaths in the United States in 2003. Cancer kills 1,500 Americans a day and is the second most common cause of death, exceeded only by heart disease. Many researchers have stopped talking about achieving Nixon's goal of curing cancer. Still, there has been steady progress, at least in some cancers. For example, about 85 percent of children now survive leukemia, which once was a death sentence. In other cancers, there has been little or no progress. Only 3 percent of patients with glioblastoma brain cancer, the type that killed Chicago sportscaster Tim Weigel, survive five years. Screening tests such as mammograms for breast cancer, PSA tests (prostate cancer) and colonoscopies (colon cancer) have enabled doctors to detect cancer at an earlier stage, when it's more treatable. There also have been improvements in surgery, radiation, chemotherapy and other treatments. About 10 million Americans have survived or are fighting cancer. About 5 percent to 10 percent of all cancers are strongly hereditary. About 6 percent are caused by pollutants. Slightly fewer than one in two men and a little more than one in three women have a lifetime risk of developing cancer. About 76 percent of cancers are diagnosed in people 55 and older. One reason that it's taken so long to defeat cancer, of course, is that the term--cancer--applies to not just one malady, but many. However, there is reason to be hopeful about this war being won. More recently, medical science, common sense, and prayer have yielded victories over another deadly, admittedly less multifarious disease: AIDS. These examples should hearten us to declare war on yet another disease scourge: Alzheimer's. Writing in today's Washington Post, Robert Essner says that the stakes are too high not to make the cure of Alzheimer's a national priority. Alzheimer's doesn't have to be an inevitable part of aging. It is a disease for which research can find a cure, or at least a more effective treatment. In that way, it could be like HIV-AIDS -- a disease that, for most sufferers, went from a lethal diagnosis to a treatable chronic condition within six years of its discovery. One breakthrough AIDS drug rapidly led to another, because we mobilized pandemic-strength muscle against it. In addition, the Food and Drug Administration created review and approval processes that helped new therapies for AIDS reach people who needed them years ahead of what would have otherwise been possible. The FDA now needs to give the same priority status to drugs for Alzheimer's as it has for AIDS and cancer treatments. And, the federal government needs to designate Alzheimer's as a No. 1 research priority. If we don't do these things, the projections are staggering. Within the next five years, nearly a half-million new Alzheimer's cases will be diagnosed annually, as 78 million baby boomers reach age 65. Given those numbers, most of us will either become an Alzheimer's patient, care for one in our home or know a patient in our extended family. By robbing victims of memory, Alzheimer's strips away individuality, dignity and independence. Alzheimer's is expensive. It requires $19,000 a year in out-of-pocket costs for each caregiver family. Last year Medicare spent $91 billion for Alzheimer's. That figure will nearly double in just four years -- and keep soaring as 14 million cases are diagnosed in boomers' lifetimes. For every month we hesitate, we will find ourselves spending down the nation's health-care budget to care for the demise of millions of people. We should be preparing to cure them. We could make my generation the last to dread Alzheimer's. It is time to accelerate the pace of our efforts and take the battle to a level on par with our hope. Essen doesn't speak as an entirely disinterested observer, of course. He is the chairman, president, and CEO of Wyeth Corp. His company stands to reap profits from a war on Alzheimer's. But the logic of his arguments for a concerted national effort, with perhaps, the federal government acting as the catalyst, is irrefutable. If we expect to defeat Alzheimer's, we need as a country to increase our efforts to match that aspiration. The savings of lives, monies, and memories will make the effort worthwhile. To avoid the unprecedented ravages this disease will soon unleash on Baby Boomers, their spouses, and their families, the time is now to make this commitment! Our progress against cancer and AIDS, as well as the cures of countless other once-deadly diseases indicates that we can defeat Alzheimer's. And we must! First, my GodBlogCon 2005 pal Alex Jordan announced that he was suspending his blogging activities. Then, Christopher Althouse, promising new blogger, said that he was quitting altogether. Commenting on the latter announcement, Althouse's brother, both of whose parents blog, approved his brother's anouncement, intimating that anyone who blogs must be nuts. I've been doing this for four years now and enjoy it. Is this final, conclusive proof that I am, in fact, nuts? Maybe. Clarifying Again What I Was Trying to Say in "Jesus is Not a Republican"
I find that my post of several days ago may not have been as clear as I would have liked. So, to clarify things a bit, I believe that Christians have every right to participate in politics. Indeed, I believe that they should participate. They should also be guided by their prayer, their study of God's Word, and their Christian sensibilities as they vote, donate to candidates and causes, and so on. What I object to, and object to strenuously, is the attempt by some clergy types and Christian leaders to hijack the Gospel, presuming to enlist Jesus in support of their own specific political agendas. I object to them allowing politicians to use the church, as is happening this year in Ohio's gubernatorial race, to collect funds for political campaigns or to let candidates make campaign appearances during worship. I object to preachers who presume to tell their flocks that Jesus Christ prefers Candidate X or Party R or D.
Faithful, Bible-believing, Jesus-following Christians can and do disagree about political issues. For example, the party to which I belong--the Republican--generally advocates an end to abortion, certainly a position rooted in Christian ethics. But Democrats frequently oppose capital punishment, also because of the value they place on human life. You could go down a list of issues like these and show the Christian underpinnings of opposing views. Rare is the political issue on which a "Christian" position is unambiguously clear. "I laughed out loud when I read this assertion by Laubach: 'We can do more for the world with prayer than if we were to walk into Whitehall, London, or the Kremlin in Moscow, and tell those men [sic] what to do---far more! If they listened to our suggestions, we would probably be more or less wrong. But what God tells them, when they listen to Him, must be right. It is infinitely better for world leaders to listen to God than for them to listen to us.' These lines made me laugh because I thought how right Laubach was. I remembered how many times I held doggedly to an opinion about a political matter only to learn how misguided and wrong my view had been. How much better it is to humbly and trustingly place matters in God's hands, confident in His infinitely superior judgment. And how much better it is to put frail human leaders in God's hands than trying to manhandle them with my very fallible opinions and judgments!" Of course, Christians can and should be involved in political affairs. But, except in the rarest of instances, no official church body, clergy person, or Christian leader should say more than, "As Christians, we think this. But we can't claim the imprimatur of heaven for it." Most of the time, except on those things directly addressed in Scripture, nobody has the authority to say, "Thus says the Lord..." That's not only preumptuous. It borders on the idolatrous, idolizing either our selves and our own intellects or idolizing the ideologies to which we dare to subordinate Jesus Christ. More Than Simply Reese Witherspoon's Ancestor...A Lot More! Read this intriguing piece on Rev. John Witherspoon, the only clergy signer of the Declaration of Independence. I was led to it Callimachus at Done with Mirrors, to which I was in turn alerted by Readeriam in her comments on this post. It’s possible for us to lose valuable things, to let them slip through our fingers, sometimes because we have no idea how valuable they are. But there's another big way to lose things of value. You’re probably familiar with the term “jumping the shark.” It was invented by four University of Michigan students twenty-one years ago. Bored, they talked about the episodes when they knew their favorite TV shows started going downhill. They decided that for Happy Days, the downhill slide began when Henry Winkler’s ‘Fonzi’ jumped a shark. The friends then adopted that term, “jumping the shark” to describe any point when TV series passed a point of no return, when they weren’t as good as they’d been before. Just as surely as we can lose valuable things we never knew had value, we can also lose those things we know have value by taking them for granted. I’m sure that the producers and cast of Happy Days didn’t intend to let the show deteriorate after Fonzi jumped the shark. But fans and critics agree that it did. As we work together with him [that is, with God], we urge you also not to accept the grace of God in vain. For he says [here, Paul cites a passage from the Old Testament book of Isaiah, a place in which God promised the giving of the Savior Jesus, Who would be born 750-years later], ‘At an acceptable time I have listened to you, and on a day of salvation I have helped you.’ See, now is the acceptable time; see, now is the day of salvation! A good way to paraphrase Paul’s words might be: Don’t lose the most valuable thing you have! Don’t let your relationship with Jesus Christ jump the shark! In spite of what some say, it is possible, through indifference or neglect, to lose one’s faith relationship with Jesus Christ, just as we can lose other relationships in our lives. Jesus Christ gives all who turn from sin and put their lives in His hands forgiveness and everlasting life. They’re His free gifts to all with faith. But God never forces anyone to keep living with Him at the center of their lives. That’s why Paul begs the church at Corinth--and this church--not to jump the shark, to keep our relationship with Christ alive, to keep living for Christ in the here and now. Paul knew that no matter what might happen to him, he still had Christ with him and Christ’s hope in him because Christ was for him. That’s why he hung in there with tough, persverant faith. There are Christians who risk losing all the blessings God wants to give us in this life and all the joy He promises in eternity by failing to keep Christ at the center of their lives. Do you remember Jesus’ parable of the lost sheep? A shepherd had 100 sheep and one turned up missing. The shepherd so valued every single sheep that he left the ninety-nine he had in the sheep pen to go find the lost one. When the shepherd found the missing sheep, he threw a party. Just so, Jesus says, there’s a party in heaven every time a sheep that was lost gets found. Now, in that parable, you and I are the sheep. We’re part of Jesus’ flock. He’s the Good Shepherd and it’s hard to imagine that anyone who belongs to Jesus would walk away. But, you know, sheep are dumb. They see a thatch of grass a little ways off and they go to try it out. They see another and do the same. And so it goes until they find themselves far away from the shepherd. We can be dumb sheep ourselves sometimes, chasing after things that may seem more important than Christ at the time and when trouble hits, panicking when we should be praying. The most valuable thing you and I have is our relationship with Jesus Christ. We won’t lose that relationship when we trust Christ through thick and thin. First: Make and keep an appointment with God each day. By that, I mean, spend some time with the Bible, maybe the Our Daily Bread devotional booklet we give away for free here, and a list of prayer concerns. Pray about what you read and ask God to do His will in your life and in the lives of all for whom you pray. Second: If this isn’t a habit you’ve cultivated, commit yourself to worshiping at least three times a month and get involved with one of our small groups or Bible studies. Christianity is not a solo enterprise. Christians are meant to take the journey of faith and life with the Church universal and local as our family. When you’re with other Christians, silently ask God to help you be attentive and caring. At the end of today’s lesson, Paul told the Corinthian church, “our hearts are wide open to you.” Ask God to make your heart wide open to your fellow Christians. Third: Commit yourself to serve in the greater community. Hearts wide open to Christ and to fellow Christians are also meant to be open to all their neighbors. The thermometer in the lobby is designed to record the information you provide on our weekly attendance sheets about the hours you’re volunteering beyond the walls and outside the ministries of Friendship. These three suggestions are rooted in those three priorities for churches and Christians I’ve mentioned the past two weeks--loving Christ, loving Christ’s people in the Church, and loving the world. None of us is capable of loving like that on our own. But if we’ll make ourselves available to Him each day, Christ will fill us with His love. With that power to love will also come the stronger faith that goes with joyful, confident living. We’ll have faith that never jumps the shark and always holds onto Christ! 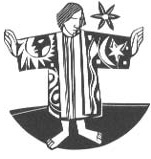 [The "jump the shark" motif is suggested by HomileticsOnline in a 2003 sermon, created by one of the originators of the term twelve years after their late-night conversation. [It's Ray Ortlund who tells the story of the rare book collector and his different friend and also shares the insightful three priorities for churches and Christians here.